The original, contains 20 tools for sample manipulation and measurement. The tips of these tools are 10 micrometers thick and can be used to support samples in X-ray beams, producing less background scatter. MicroTool Kits 2 and 3 are made from a thicker polymer and are more durable, and replace Kit 1 in all applications except those for which minimizing X-ray scatter from the tools is important. Each tool is mounted on a 25 mm in length and 0.025"/ 0.64 mm diameter nonmagnetic solid stainless steel rod. Hold them in a standard 0.7 mm mechanical pencil (included with each kit), or in a micromanipulator. 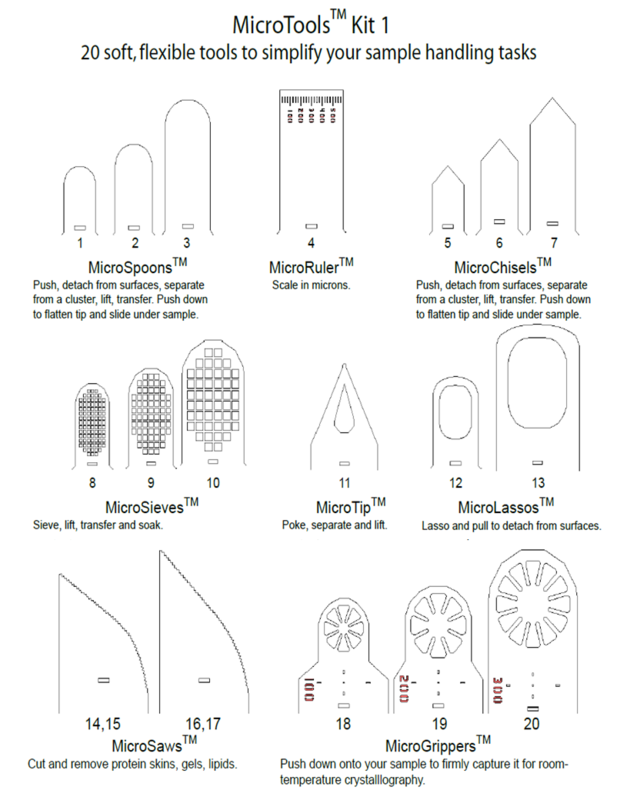 MicroSpoon: One each of small, medium and large sizes. Use to push, detach from surfaces, separate from a cluster, lift, and transfer. Push down to flatten tip and slide under your sample. MicroChisel: One each of small, medium and large sizes. Use to push, detach from surfaces, separate from a cluster, lift, and transfer. Push down to flatten tip and slide under your sample. MicroLasso: One each of small and large sizes. Use like a loop to lasso, pull and detach a sample from a surface. MicroSieve: One each of small, medium and large sizes. Use to sieve samples out of solution, and to lift, transfer and soak. MicroTip: One 50 micrometer diameter tip. Use to poke, separate and lift samples. Also use to reposition samples on a MicroMount or MicroMesh. MicroGripper: One each of small, medium and large sizes. Push down onto your sample to firmly capture it, or slide underneath your sample to delicately support it. Holds crystals rigidly without damaging them for room temperature X-ray measurements. MicroRuler: One 600 micrometer wide ruler, with 25 micrometer gradations. MicroSaw: Two saws. Use in conjunction with a needle to cut and remove protein skins, gels, dense lipid phases and soft tissues from around your sample. Click the button below to add the MicroTools Kit #1 to your wish list.